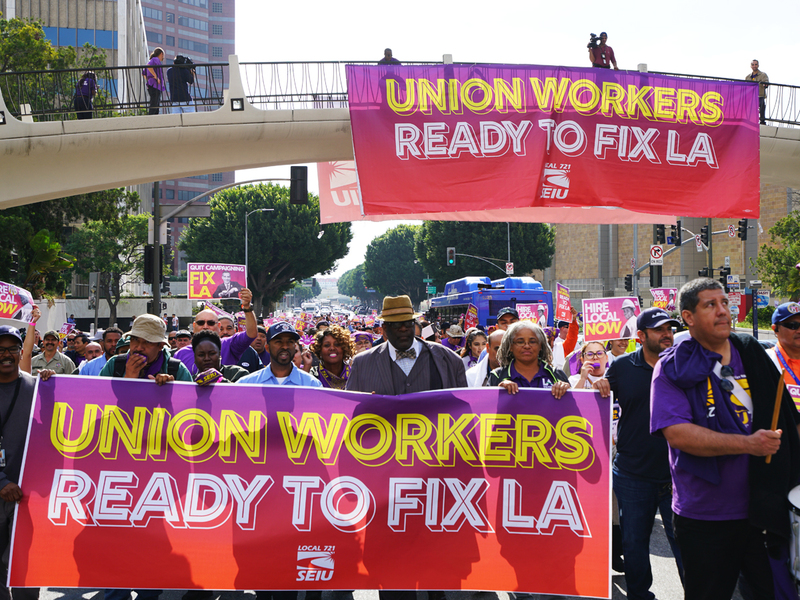 Over one thousand L.A. City members and community allies marched this morning from Los Angeles City Hall through the Civic Center to deliver the message to Mayor Eric Garcetti: Quit Campaigning and Fix LA! For months, the SEIU Local 721 Bargaining Team and the Coalition of City Unions have been in slow-moving contract negotiations with the City management, who keep insisting on balancing budgets on the backs of City workers. While Mayor Eric Garcetti tours the early Presidential primary states and touts guaranteed health care for all, his contract negotiators are hell-bent on sticking workers with elevated health care costs that make it even more difficult to live in Los Angeles. April of this year marked the second anniversary of Mayor Eric Garcetti signing an executive directive to create 5,000 new jobs by 2018 and restore city services still suffering from drastic Great Recession-era cuts. Despite the economy roaring back, the City is still operating with recession era staffing levels and the Mayor has not shown any urgency to reach this 5,000 jobs goal by the end of this year as promised. 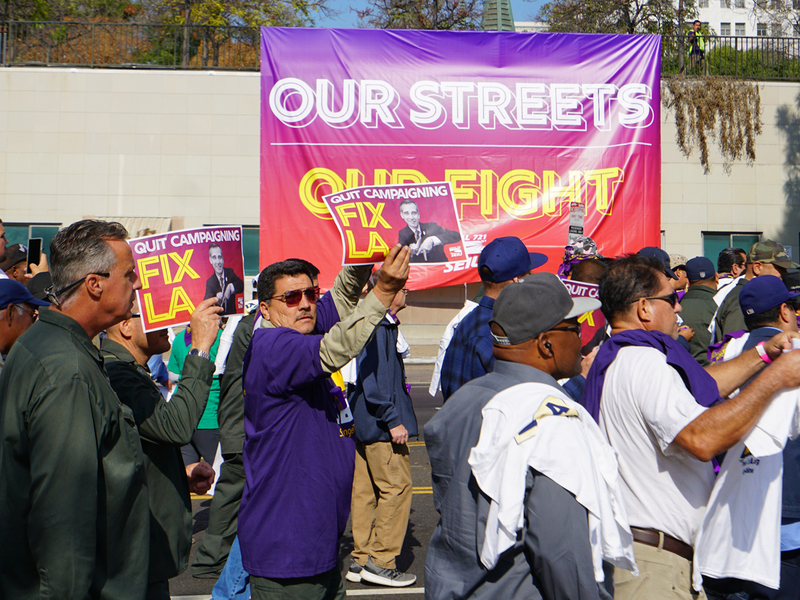 “Mayor Eric Garcetti, stop rubbing elbows with major donors and roll up your sleeves and work with us to hammer out a fair contract,” said SEIU Local 721 member and City Employee Lamont White at the pre-march rally. “Deliver on the 5,000 City jobs you promised. Lead this City back to adequate service levels — we are still running at recession level staffing,” he added, before leading the rally into “No More Hobnob, FIX LA” chants. 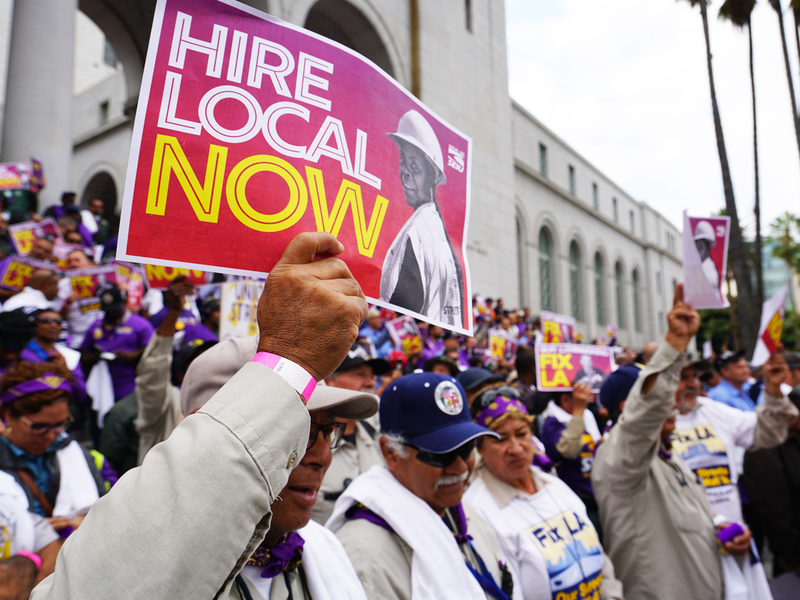 The City Hall march and rally is the latest in a round of public actions by City Workers and community allies frustrated by an L.A. Mayor who’s too busy campaigning for his next job. Just last month they staged smaller actions at the Mayor’s San Pedro office and inside Los Angeles City Hall chambers. “I am prepared to fight. Are you ready stand with me? We’re going to fight for every City Worker,” he added. If today was any indication of City workers’ power and growing momentum, the next public action might be one for the ages. They’re going to make it very clear —the road to the White House starts in L.A.
Stay tuned and stay engaged for what’s next! Where can I find information on the current negotiation for City of Los Angeles Refuse Collection Operators? Yes. All income is taxed, this included.